Will Newton '19 has been selected for the Youth Leadership Pinellas (YLP) Program for the 2017-18 school year. Founded in 1998, Youth Leadership Pinellas is a series of interactive days designed to educate high school teens on community resources and issues, develop an excellence in leadership, build teamwork skills, and foster involvement in community services. Only 40 students are selected for each YLP class. YLP is a seven-month program operating from October through April. Students engage in six full-day sessions, plus an orientation retreat and graduation dinner. During each program day, the students have the opportunity to meet community decision makers and to engage them in frank, off-the-record discussions on current issues. 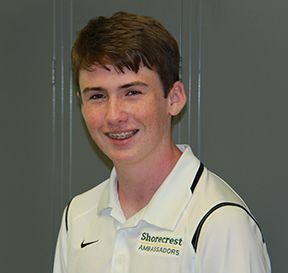 At Shorecrest, Will is a leader in the Class of 2019. He is a member of the Student Ambassadors, a group of 20 students selected to represent the school to prospective families and the greater community, and a staff writer for "The Chronicle" Upper School newspaper. A passion for service, Will serves as Director of Sponsorships in the school's annual Relay For Life event; off campus, he is a member of the Neighborly Care Network. An athlete and dedicated student, Will enjoys playing tennis and baseball (Team Captain) and is also a seasoned competitor in the National History Day competition, having advanced to both the State and National levels. YLP has a highly competitive selection process where students who apply must meet eligibility requirements, prepare a comprehensive application, provide letters of recommendation, and participate in a panel interview. Congratulations Will!